Some weeks your eating is just off. I get it. You’re too busy to prep veggies, so you grab a burger and fries. You’re stuck with a tight deadline, so you end up eating pizza at your desk. Derailed diets get the best of everyone, and it’s totally okay. Life happens. You can’t be perfect all the time. Of course, the problem with a few weeks of lost food focus is the inevitable consequence: your waistline starts to feel a little soft; your pants start to feel a little snug and your belly starts to become more bloated than normal; maybe you’re feeling lost in a brain fog funk, or perhaps some diet-related health issues have sprung up—a general lack of energy, severe cravings, constant hunger, digestive issues, and headaches can all be caused by an unbalanced approach to eating. Having experienced this, I’ve found one of the fastest ways to “get back on track” is to simplify your meals for a couple of days. It’s not necessary to go all out with a juice fast to get your body back in tune; simply eating clean can do wonders for your body. Really. Blend up a fruit-free, high-protein green smoothie for breakfast. 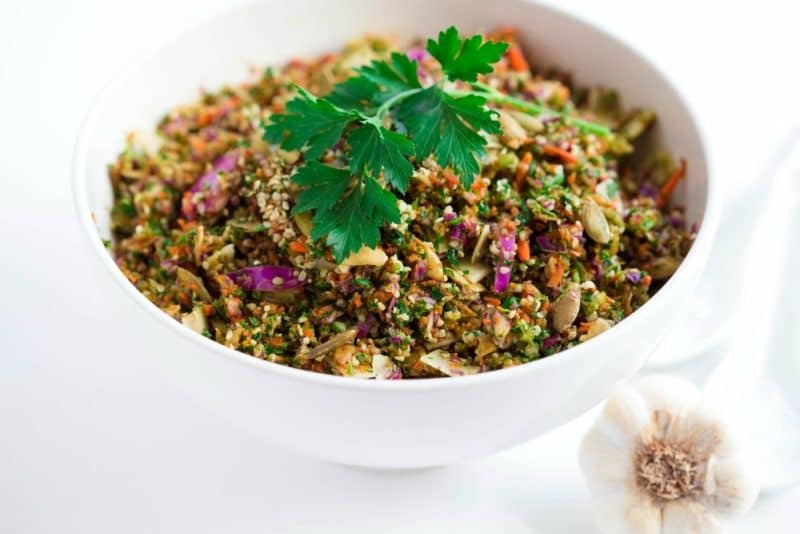 Enjoy this Detox Salad for lunch. Finish Your day with a plant-based dinner. By following a nutritional ‘detox’, you can boost your metabolism, optimize digestion, and stabilize your health and hunger. Remember, you can’t just add a salad to your afternoon and call it a day. Starting a food detox involves removing junk food from your diet and adding in food with lots of nutritional value. 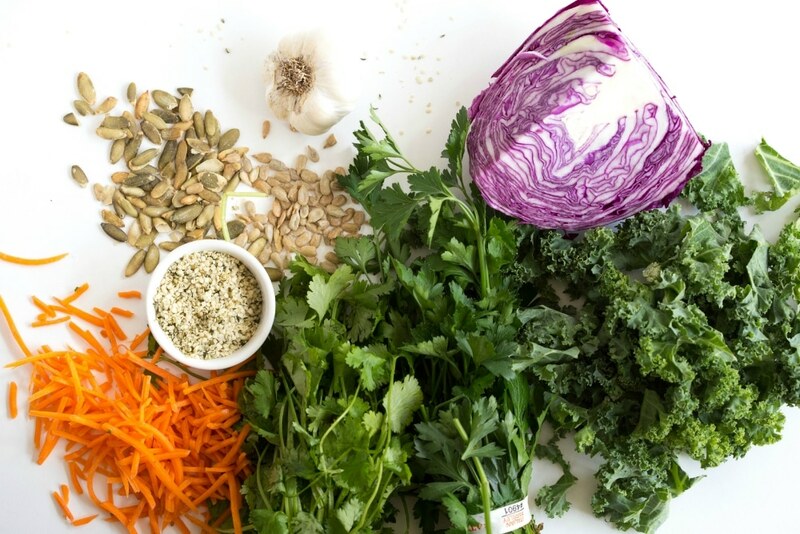 This recipe is a perfect way to kick off a detox. Keep a big bowl of this delicious and fragrant salad in your fridge to use as a lunch, dinner, or mid-day snack. I’ve loaded this recipe with cabbage, and for good reason. Not only does cabbage cleanse your liver, it also aids with the digestive process to expel toxins. The sulfur in cabbage breaks down chemicals in your system, and indole-3-carbinol boosts DNA repair. 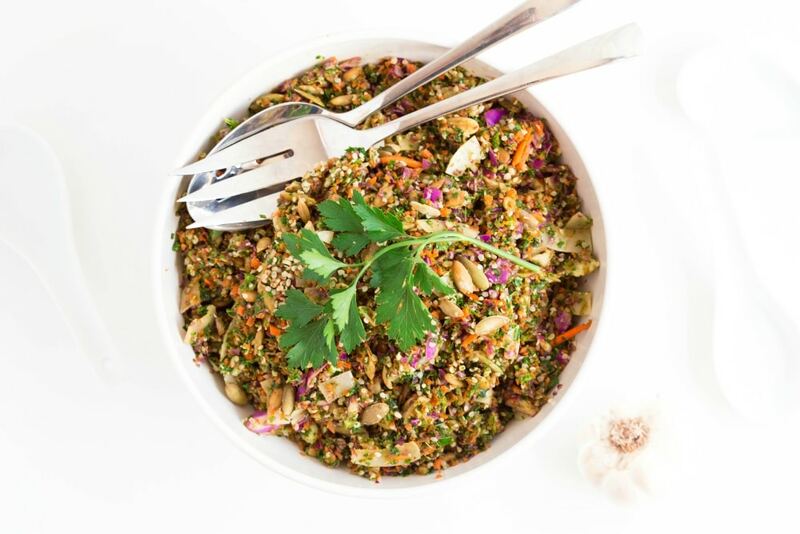 Kale is also a superstar veggie that provides support for the detox system, and parsley is a diuretic herb that adds flavor to this salad as it flushes your system. As you start your nutritional detox, make sure to stay away from sugar, flour, processed foods, caffeine, and alcohol, and don’t forget to drink extra water. Simply put, this salad is a refreshing, tasty addition to your detox diet, and will help to reset your body. 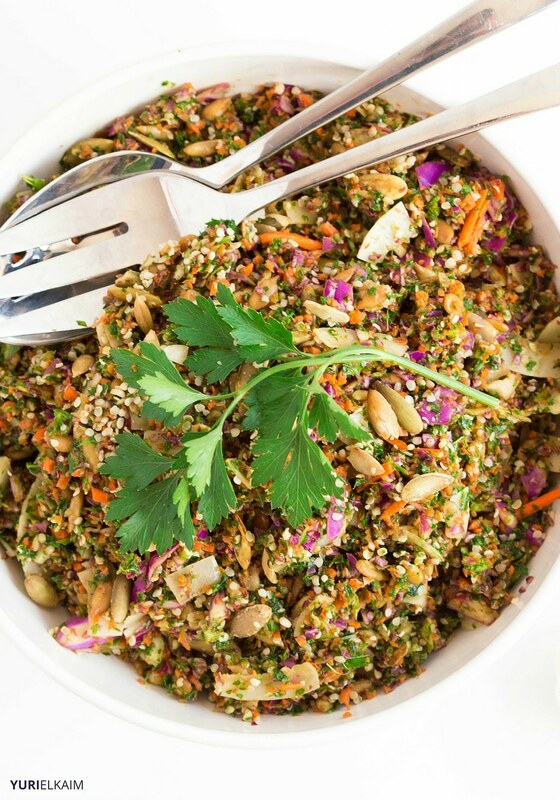 This salad recipe is a perfect way to kick off a detox. Keep a big bowl of it in your fridge to use as a side dish or midday snack. 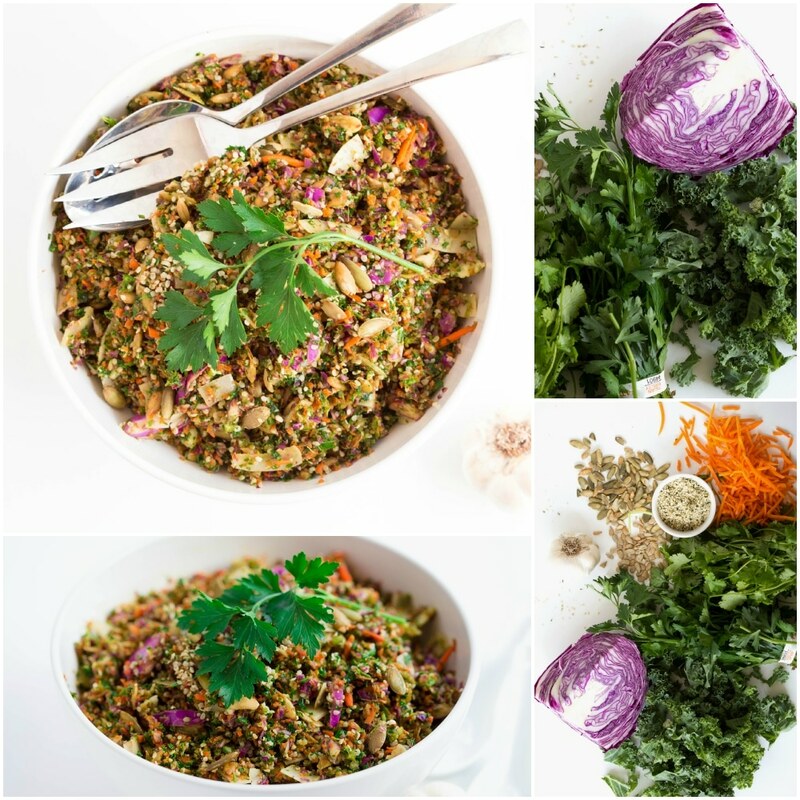 In a food processor, pulse cabbage, kale, parsley, cilantro, carrots, ginger and garlic until coarsely chopped. Pour into a large bowl. Toss with remaining ingredients. Serve and enjoy. Will store in fridge for up to six days.